That’s español for “coconut bread”. On the beaches of the Caribbean you’ll find people selling this delicious sweet bread so that you can enjoy a taste of the tropics while you work on your bronze body glow on the white sands and blue waters…obviously I’ve been subconsciously thinking about the beach during these cold January days. Oh, I have plans to enjoy this roll indeed. In front of the heat of an open oven in my summer tank top and flip flops. What is the difference between using butter and vegetable shortening? The quick answer is that there isn’t a huge difference, the bread just needs some sort of fat to create the texture. Butter leads to flakier breads and shortening yields higher, fluffier breads. I’m definitely going for the light, fluffy bread route, so I chose to use shortening over butter. For a longer butter vs. shortening explanation, read more here. The first thing I did was get the water at the right temperature to activate the yeast (between 110 – 115 degrees). During that 15 minute time I measured out the rest of my ingredients. Once the yeast in water got frothy, I added it to the sugar and coconut. 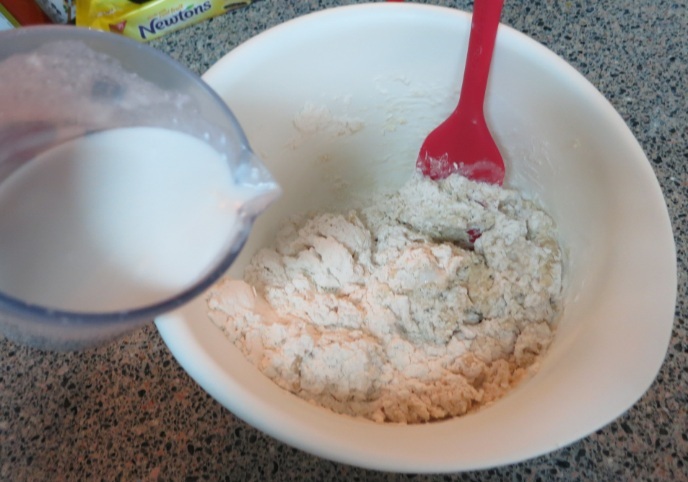 When that was nice and mixed together, I added it to the flour and salt, followed by the melted shortening and coconut milk. Interesting thing about coconut milk: It naturally gets clumpy so you have to shake the can first so it gets liquidy again. I prefer to mix with my hands. It feels good to get my hands dirty when making bread. I don’t have any pictures of that because my hands were covered in dough and there was no one around to take pictures for me. Just use your imagination. Once the dough became soft and elastic, I put it in a big bowl and covered it with a kitchen towel and waited about an hour and half for it to rise. I love seeing how big and puffy the dough gets. After that, I kneaded it a little more then cut the dough into 8 pieces like the instructions said to do. I didn’t have a dough cutter for this, so I had to settle for the edge of pie cutter. Then I put it on greased parchment paper (greased for real this time!). 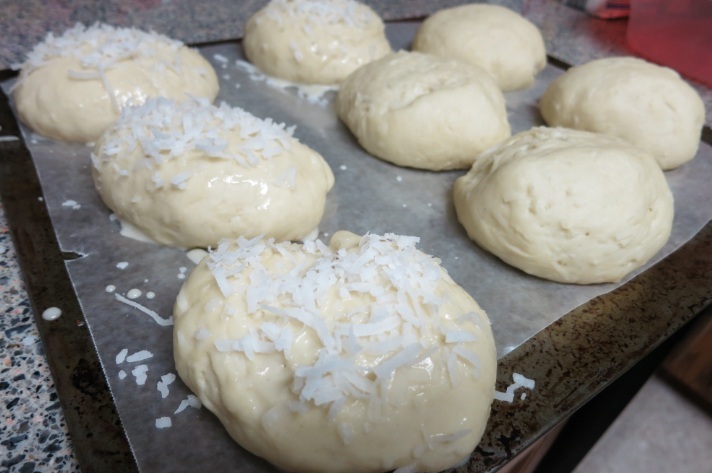 I read in the comments for this recipe that one reader brushed honey and coconut milk on top of the dough and sprinkled it with coconut flakes before putting it in the oven. What a great idea! Yes, they look like dinner rolls with coconut sprinkled on top of them, but you know what, they didn’t come out bad at all. 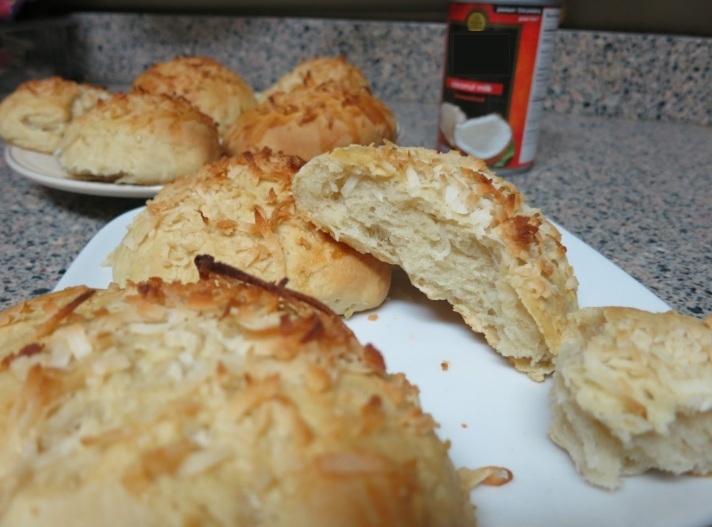 My expectations were a little high – I expected a much more powerful coconut flavor, but I learned from doing this recipe (and consulting a bread expert) that coconut tends to have a buttery flavor to it, which I didn’t know before trying this. Actually, I feel inclined to slab more butter on these. These would make great sides for a meal. I’m glad I read the recommendation to add honey and coconut shreds because it added a, what I think, necessary sweetness to the bread. Presentation: Fluffy and round! Very nice. The toasted coconut on top is a good indication that this is most definitely a coconut bread. Tastiness: Tasty for sure. 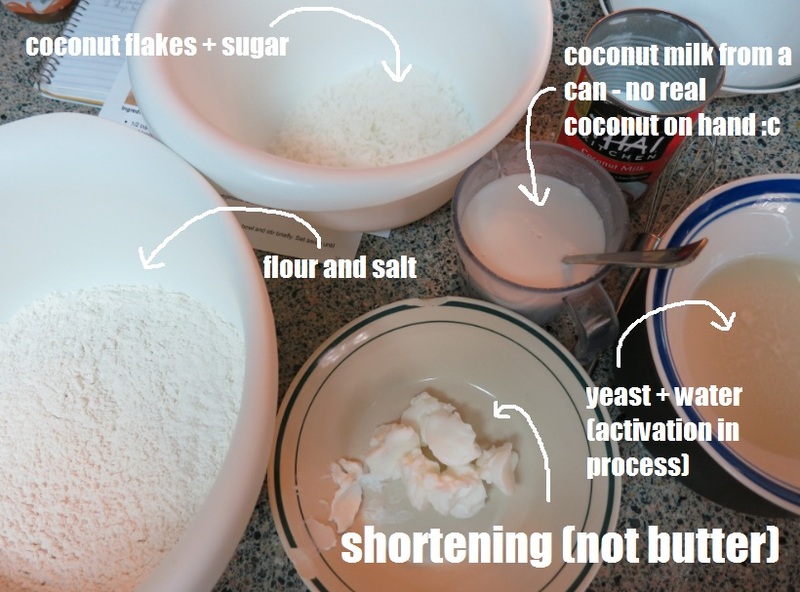 Maybe I’ll add more coconut flakes next time. Rematch? : I said “next time”, didn’t I?